The demand at this time was for fortified wines but slowly a market increased for red table wines from immigrants working at the new industries in Whyalla, Port Pirie and Port Augusta. Highlights include the first of the Bulls Blood which was made in 1967 and was called 'Bikaver'. Later came the realization of the great riches of the Barossa Valley in old vine shiraz, mataro and grenache. Experiments at Veritas and a number of other, mostly small Barossa wineries followed and led through the 1980's to the release of many exciting old vine varietal blends. 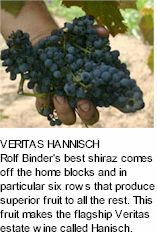 Veritas slowly gained recognition and in 1996 and 1997 was awarded the Trophy for Best Small Producer at the Barossa Wine Show and the Trophy for the Best Barossa Shiraz. In 2002 Veritas again won the Trophy for the Best Small Producer. More recently Veritas has been awarded twice in 2002 and 2003 the Trophy for the Best Semillon at the Barossa Wine Show. In 2002 Veritas were the makers of the top three pointed semillons at the Barossa Show and included the gold medal and trophy winning wine. Wine merchant Noel Young is based in Cambridge U.K. and holds a real passion for the Rhone varieties that matched Rolf's own. Most of the Magpie Estate's production are released into the English market with smaller parcels kept for Australia. The grapes used for Magpie wines are from spme of the better vineyards in South Australia as well as the estate's own. 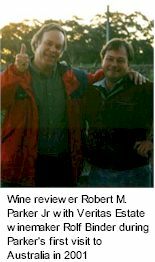 Noel likes more new oak than you would find in Rolf Binder's estate grown Veritas wines, and he takes the trip to Australia twice per year so that he and Rolf together can taste the various parcels of wine and agree on final blends for bottling. The Magpie expression changes from label to label and this is done to poke fun at wine pretension. The range can vary from vintage to vintage and the following wines have been made over the last few years. Magpie Estate ‘The Thief’ Barossa Valley Mourvedre Grenache. The mouvedre (mataro) in the Veritas Bulls Blood is made from the heavy grape skin mat left over after the ‘free run’ juice is run off. Some of this juice which is light in colour, like a rose, but high in alcohol goes into ‘The Thief’. The Grenache can have a number of sources. The blend percentage varies but is around 50%-50%. Magpie Estate ‘The Schnell’ Barossa Valley Grenache Shiraz. Sourced from a wide number of growers and in the case of the 2003 this numbered eight. A delicious early drinking style and while the varietal percentage will vary it is about 50%-50%. Magpie Estate ‘The Fakir’ Barossa Valley Grenache. Sourced from a number of vineyards for the first few years but is now mostly sourced from James Mader vineyard that lies on the valley floor at Light Pass in the Northern Barossa Valley. The winemaking team at Magpie Estate like to keep their options open about the final blend. Magpie Estate ‘The Sack’ Barossa Valley Shiraz. A wine designed to cellar. Sourced from many growers, a tonne here and a tonne there, from old school friends and a circle of closely knit growers.